Because I love to jet set around the world, I wind up spending many hours of my life in airplanes. As you jet setters know, you don't always feel so great after a long flight, and I've had many bad experiences. Over the years, I have slowly learned the tricks of how to bounce back and to feel great after jet setting. Here are the 5 things I do to make sure that I arrive at my destination feeling my best...I thought I'd share them with all of you! 1- EAT LIGHT: (that’s not too hard on a plane these days) and don’t drink anything carbonated or else you may wind up with gas (a.k.a "jet belly"). 2- STAY HYDRATED: Drink at least one 8-ounce glass of water for every hour of flying time. If your body is properly hydrated, you will be more flexible and your muscles won't cramp up as much. 3- DON'T DRINK TOO MUCH ALCOHOL: In general its best not to drink any alcohol when flying, but if you do drink, try to keep the alcohol to a minimum—it’s also very dehydrating and I've read that your body metabolizes it differently in the air than on the ground (1 drink in-flight= 2 drinks on the ground). 4- SET YOUR WATCH TO LOCAL TIME: I change my watch after take off to the time zone of my destination and I set my mind to the local time. I try to get in sync with where I am right away. Unless you have to make a call home or there are business hours/meetings that you need to be mindful of, forget about what time it is back home. 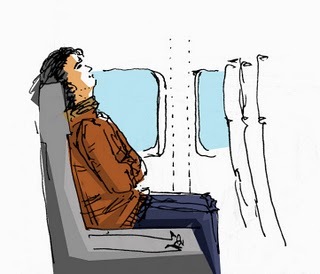 5- SLEEP: Get some sleep on the airplane if you can. I find that Tylenol PM always helps me catch some zzz's. With some sleep you will feel more rested and if you are jet setting overnight, it will help you to reset your internal clock to the time of the place you’ll be visiting. Thanks....this is great information as my husband & I will be traveling to Aruba in a few weeks. I never thought about taking tylenol PM. To stay as comfortable as possible during air travel a private jet membership goes a long way. You can have all the privacy and leg room you want.